I think it’s now fair to say that this series that I started back in July last year has served to curse the wide receivers that featured within it. Previous wide receivers evaluated for this series have included Terrelle Pryor, Sterling Shepard and Pierre Garcon, each of whom either had a disappointing 2017 season, or as in Pierre Garcon’s case was unfortunately injured for the season shortly after my piece on him. Now we take a look at New York Jets wide receiver Robby Anderson. Right after I finished this piece it was widely reported that Anderson had been arrested in Florida on suspicion of reckless driving, evading police and threatening a public servant. So forget the Madden curse, the Option Route curse is now real it seems. Anderson however was a fun to player to watch and evaluate throughout the 2017 season, so without further ado. The New York Jets have perhaps been the biggest surprise this past season after finishing 5-11. Not a bad record for a team that was heavily tipped before the season to have a chance at becoming the second 0-16 team in NFL history, following the infamous 2008 Detroit Lions. The Jets roster, on paper at least, appeared to be the worst in the league heading into the 2017 season. But one player who certainly gave the Jets offense a useful and effective weapon in their passing game was second-year wide receiver Robby Anderson. Many considered him the best of a bad bunch within the Jets WR corps, yet not many would have seen the type of production we saw from Anderson. A fair assessment given the somewhat unstable quarterback situation heading into the season and just the general overall talent, or lack thereof, on the Jets offense. The efficient play of Jets QB Josh McCown and the impressive play calling of former offensive coordinator John Morton is certainly worth mentioning here in how it has contributed to Anderson’s production. However, when evaluating Anderson’s play, it’s clear to see how much he has developed in his second year and why the Jets and their fans should be excited for his future with Gang Green. Robby Anderson has just finished his second year in the NFL after going undrafted after the 2016 NFL draft, where he was signed by the New York Jets as an undrafted free agent. Anderson, if nothing else, had an interesting collegiate career after committing to Temple University to play for the Temple Owls. In 2013, Anderson switched to wide receiver after practicing primarily as a defensive back, while seeing time on special teams the year before. In his first year as a wide receiver he caught 44 passes for 791 yards and 9 TD’s and set a Temple University single game record in receiving yards with 239 vs SMU. His senior season in 2015 was his best, as he hauled in 70 catches for 939 yards and was selected to the East-West Shrine Game that year. While not your prototypical wide receiver, measuring 6’3’’ and 190lbs, he did manage to run a 4.34 at his pro day. Yet, this wasn’t enough for Anderson to get drafted. Despite this, he won a spot on the Jets 53-man roster in 2016 after a solid pre-season where he led all players in receiving yards with 264 on 13 catches to go along with 3 TD’s. He would finish his rookie season playing in all 16 games with 8 starts. 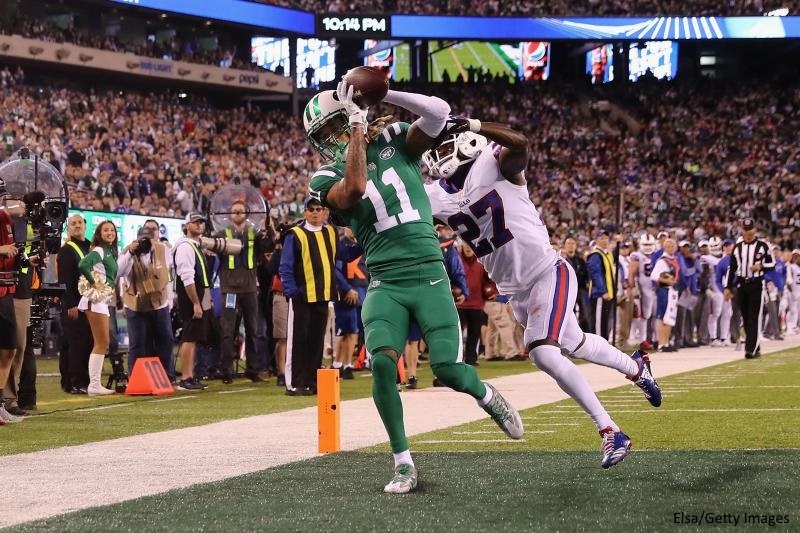 Per Pro Football Reference, Anderson led all Jets receivers in targets (114), yards (941) and TD’s (7) and was only 2 receptions behind fellow WR Jermaine Kearse (63) for the team lead, in 2017. When looking back at the notable production from the 2016 wide receiver draft class, Anderson is the second most targeted wide receiver, fourth in receptions, third in yards and second in yards-per-reception. He has also yet to miss a game. With the return of fellow wide receiver Quincy Enunwa in 2018 and the Jets likely to bring in a wide receiver or two via free agency and/or the draft, Anderson will certainly see more competition heading into next season. However, we have seen already that he has earned the right to be a core member of the Jets WR corps in 2018. When watching Anderson’s 2017 film, the first thing that springs to mind is his incredibly thin frame. He almost has the look of a prototypical slot receiver, but he is 6’3’’, and to go along with his 4.34 speed that allowed the Jets to not just line him up in the slot position, but also on the outside, working the sidelines on some deep balls. Purely from a trait standpoint with Anderson, it all begins with his release and how he uses his acceleration and burst to give him separation, particularly on deep balls. On this play against the Los Angeles Chargers in Week 16, Anderson is lined up to the left of this 11 personnel look on a 2nd down and 8 on the Jets’ 25 yard line. Once the ball the snapped, Anderson is going to run a simple crossing route underneath the linebackers. It’s what he does once when he get the ball in his hands that makes this a 13 yard gain, as he demonstrates impressive acceleration and burst to get around the corner and past the first down marker and out of bounds. The next play is similar to the one above. This time it’s against the Kansas City Chiefs in Week 13 at the start of the 4th quarter on a 3rd down and 4 from the Jets’ 42 yard line. Anderson is lined up on the inside of a trips alignment with the Jets again in 11 personnel. Anderson goes in motion and Chiefs DB Terrance Mitchell (#39) goes with him. The timing on the crossing route is perfect as he works underneath and catches the ball with Mitchell nowhere to be seen, using his acceleration to burst upfield to gain 16 yards and get into Chiefs territory. Now, we get to see Anderson use his acceleration and speed to make an even bigger play in Week 12 against the Carolina Panthers, down 12-3 with 1:19 to go in the first half. It’s 2nd down and 10 and the Jets are at the Panthers 33 yard line, needing a score before halftime. Here, Anderson is lined up to the right of the formation and on the snap of the ball runs a simple go route with a ‘’stop and go’’ 5 yards into his route. This gets the CB to hesitate for just a second, enough for Anderson to accelerate and split both the CB and SS as he enters the endzone for the touchdown. It’s worth noting that being 6’3’’ also gave Anderson an advantage here in making the catch between the two defenders. Anderson was able to show on many more occasions that he uses his acceleration, burst and speed to not only get open, but to make many more plays. We also see how he can also use – his albeit thin frame – to make adjustments in his routes if required to make a play. One such example of this came again against the Panthers in Week 12. Down 32-20 with 7:15 left in the 4th quarter, the Jets are needing a big play in the hope of instigating a comeback in this game and Anderson comes up with the big play here. Lined up wide left with the Jets facing a 3rd down and 2 on the Panthers 45 yard line, Anderson is facing man coverage as he runs a go route along the sideline. Watch here as Anderson shows great body control and adjusts perfectly to the ball which is slightly underthrown, ensuring only he can make the play despite great coverage from Panthers CB James Bradberry (#24). This next play highlights not only how Anderson can be effective as an outside receiver as previously shown, but his ability to track the ball well despite being well covered once again is on display. Against the Kansas City Chiefs, there is 5:13 left in the 3rd quarter with the game tied at 24. The Jets face a 1st down and 10 on their own 25 yard line. Anderson again lined up wide left, but watch safety Daniel Sorensen (#49), who comes down into the box, meaning that the CB Terrance Mitchell (#39) – who is covering Anderson – won’t get help over the top on this play. Jets QB Josh McCown (#15) sees this immediately and throws a perfect pass, one which Anderson tracks all the way and makes a great catch right on the sideline despite – again – being well covered. The final play I wanted to highlight in this evaluation comes from the Week 10 contest against the Tampa Bay Buccaneers. There is 0:39 left in the 4th quarter. It’s 1st down and 10 at the Buccaneers 38 yard line and the Jets are down 15-3, so they have all but lost the game at this point. Again, Anderson is lined up wide to the right of the formation facing Buccaneers CB Brent Grimes (#24) who is giving Anderson a 10 yard cushion to work with. Here we get to see Anderson’s speed deep on the go route as he is able to get in behind Grimes and use his height and reach to high point the ball for the catch and the touchdown in stride. While Anderson may never reach the production of a true number 1 wide receiver, he can certainly be a very good number 2. Right now the Jets wide receiving corp doesn’t have what you would call a true number 1 wide receiver. Plus, their QB situation is an interesting one entering the off-season. There is uncertainty here surrounding the level of play of Christian Hackenberg and Bryce Petty to this point, and will Josh McCown be back, and if so, can he stay healthy? I expect the Jets to draft a QB early in the 2018 draft. Who they draft and how this may affect Anderson’s production next season and beyond remains to be seen. However we’ve seen enough of Anderson to believe he can get better as a wide receiver in the NFL despite coming out of nowhere after going undrafted. The 2018 season is key for Anderson and he has to show he can not only be consistent and continue to be productive on the field, but also to make the most of the opportunity now given to him by staying out of trouble off the field. Follow Justin on Twitter @JustinTwell78. Check out his work here, including on how the Detroit Lions will fare without Megatron, the elite Minnesota Vikings’ linebacker corps, the Mitchell Trubisky pick, and a breakdown of Chicago Bears WR Cameron Meredith.